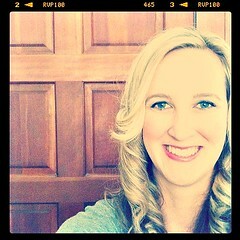 My BFF, Erin, is having another baby, a boy. I wanted to make the baby something but didn't know what since I knew Erin, her MIL, and maybe her Mom were all going to make quilts for the baby. I knew I wanted to make something else. I decided to make the baby a stuffed animal. Spot, is from this book. I used buttons as the eyes since I didn't like the felt they had in the pattern for the eyes. I love buttons. The colors Erin is going for is orange and turquoise. 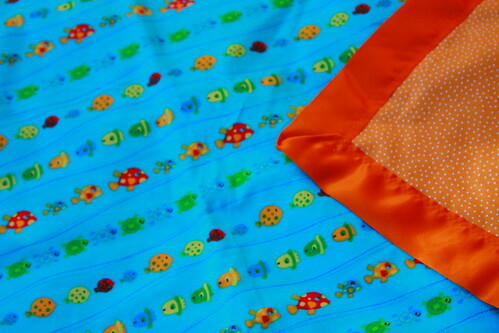 I found some great flannel and made this blanket with a silky binding. My Mom always makes these blankets and I even still have the one she made me when I was born. 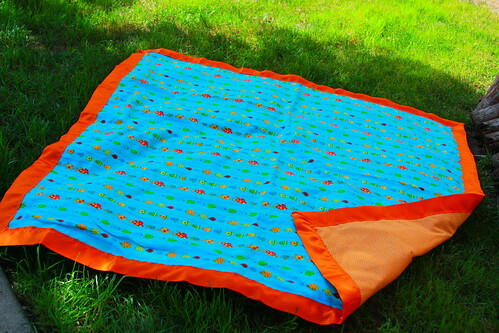 The blanket is 42 x 42 inches, a really nice size. I also made her a crib sheet from the orange with white dots flannel and a receiving blanket with the turquoise flannel and green dot. It was really great to work with flannel and I have become a fan. Wow!!! Absolutely beautiful! I love the fabric choices and colors...you have a very luck BFF!! You know I love it all. :) Seriously, I keep petting the blankets and unfolding and refolding them. I am so happy that I have one of those awesome silky binding blankets for this baby, because I know how much G. loves hers! It's all so perfect!! 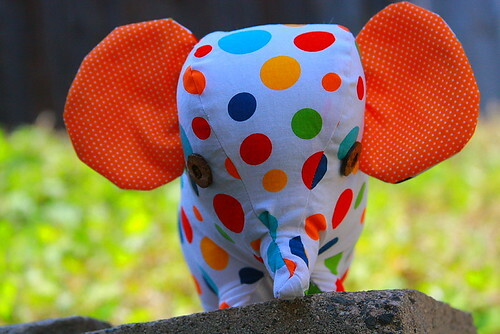 I LOVE this elephant. He's so adorable. I also love the blanket you made. I had one just like it as a baby and the edging was why I liked it so much. So cute! 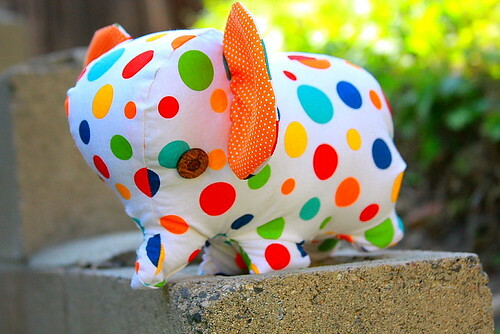 I just went and ordered that book because I want to make a little elephant, too! Oh, and GREAT colors! That is just the sweetest little stuffed toy! I love it. You're such a good friend to Erin. I really need to learn how to sew. oh, i just love the stuffed elephant!! and what a lovely blanket!! Cute, adorable, bright, cheerful can you tell I love all of it what wonderful colours and fabrics you've used. You have one very lucky friend. Those are so great! I especially love the elephant, what a good friend! orange and turquoise and my new favorites, what new Mom would not be thrilled to receive such an amazing gift, I love Spot!! 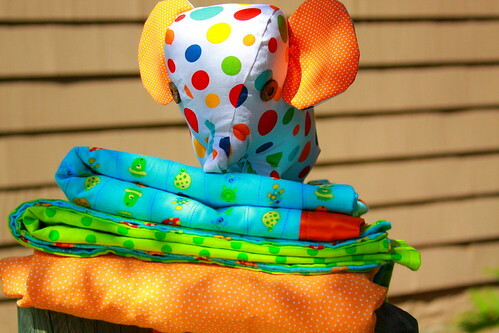 I absolutely love the elephant and I know the baby will too, but I have to be the voice of doom here and say that since you put on the buttons (choking hazards), the baby should not play with it until he is 3 or so, it should be decorative. My baby is 15 months and she'd have those bitten off in less than a second! Sorry, not trying to be the elephant police, just a thought. Oh I love elephants, how cute!! That's a wonderful gift. oh my gosh you know how to make crib sheets??? i need more for lucy!! maybe you can show me? I have that book too! 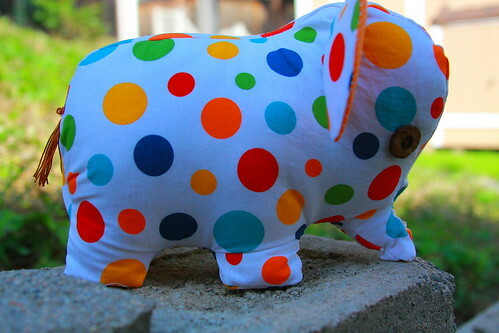 i just love, love, love the littlest elephants in them, and now i definitely have to make some for the kiddos around me (family and friends, I am still awaiting my own to arrive in October. Nice and lively colours, more daring combination than I would ever dare, but i like it! I love the blankets but the Elephant is so adorable! Any new Mom would be excited to get that. Both are so adorable, good job! Such a darling gift! I love the orange!!! I WANT that adorable blue fabric! adorable!! Are elephants the new owls? I love it. So very sweet! I think I might have to get that book based on that adorable elephant alone! That elephant is super cute! Very cute. Isn't flannel awesome! ?